Looking for Package Deals to Reno/Lake Tahoe? We have those too! There are about the same number of golf courses in the Reno/Lake Tahoe Basin as there are ski resorts. Named one of the top golf destinations in the world in the year 2000 by Golf Digest, Reno-Sparks/Lake Tahoe boasts many golf courses all within 90-minutes of the Reno/Tahoe International Airport. 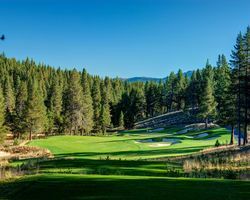 From tree-lined fairways, to mountainside links, to the dramatic views of Reno-Sparks and the crystal blue waters of Lake Tahoe, golfers will find a variety of courses designed to challenge and inspire. During the winter, a fan of both sports can golf and ski on the same day! 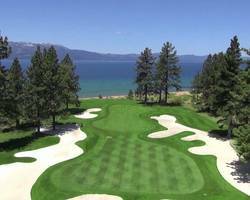 Many of the golf courses around Lake Tahoe are 6,000+ feet above sea level. Because of the high elevation you will get an extra 6 to 10 percent more distance than at sea level. A good rule is thumb is to hit one club less than you would at home. Come see for yourself all the wonders Reno/Lake Tahoe has to offer. Renowned architect Bob Cupp found a dream come true at Grizzly Ranch. He was given a thousand acres to route a course around, creating one of the best in California. Ranked the #1 course in the Sierra Nevada by Golf Digest (2014), this sprawling par-72 layout features five sets of tees, generous fairways with wide landing zones and a mountainous landscape with elevations ranging from 4,800 to 5,400 feet. From the black tees at 7,411 yards, to the forward tees at 5,374 yards, golfers can play a seemingly endless combination of shots Bordered on two sides by protected federal land, the course is part of a low-density private gated community. A Peter Jacobsen/Jim Hardy designed championship golf course, The Golf Club at Gray's Crossing gives golfers a premier 18-hole mountain golf resort experience. At Gray's Crossing, golfers will experience "a return to tradition." Fast greens and tournament-like conditions await golfers every day. Demanding a combination of creative club choices and tactical strategies, the traditional Jacobsen design reveals his passion for fun, yet challenging play. Towering Lodgepole and Jeffrey Pines line the fairways as the course weaves through a natural mountain surrounding with Mt. Rose as its backdrop. When calculating each shot, the environment plays as much a role as the course. 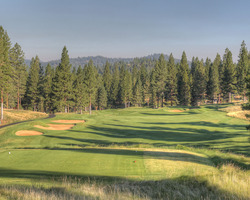 Old Greenwood is a premier four-season resort community in North Lake Tahoe and home of Jack Nicklaus Signature Golf. Here you'll discover mountain living at its finest with a selection of luxury Fractional Residences and beautiful custom-built homes. 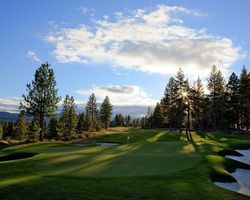 Nestled near the historic town of Truckee on 600 acres of towering pines and blue-sage covered hills, Old Greenwood is the place you'll long to be on a summer afternoon or winter evening. All year round, let the call of the outdoors beckon you to enjoy the incredible lifestyle that can only be found in beautiful Lake Tahoe, California. From humble waters to boastful peaks, the great American West is a place of synergy. At Edgewood Tahoe, our vision is informed by this inherent balance-and nowhere is it more apparent than on our acclaimed 18-hole course. At every turn, at every tee, with every swing, you'll feel this harmony-a balance that informs your game and one that will come to define it. With age-old pines, emerald greens, and snow-capped Sierras cutting sharp lines across the stunning blue sky, Edgewood Tahoe isn't just scenic-it's iconic.